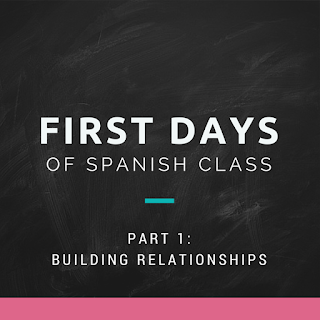 It's almost Back to School time, so today I am starting a series on what to do during the first several days of Spanish class. I'm going to talk about a few elements to include during the first few days of school and ideally you would use a mixture of these elements each day. Our principal applied this same philosophy to teaching: If you teach the curriculum, you win, you lose. If you teach the student, I guarantee you'll win. 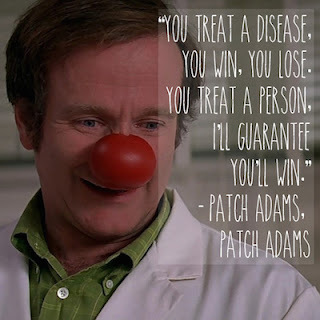 Part of our initiation as new teachers included receiving a red clown nose like Patch Adams and watching a few inspirational scenes from the movie. We had a retreat where all teachers did an "Amazing Race" type road trip and we spent the day finding lots of landmarks and interesting places in rural Georgia. We were encouraged to spend most of our first days of school doing relationship-building activities instead of teaching much material. So my first tip for the first days of Spanish class (or any class!) would be to get to know your students and build relationships! The Name Game - I have a soft spot in my heart for this game ever since I played it in my first college English class. Little did I know that Katherine shopping for kangaroos (me!) and Mario shopping for mustard (my husband!) would soon fall in love! As hard as it may be to learn over 100 names, it will really make a difference when students know that you've taken the time and effort to learn their names. How to play: Each student thinks of something that starts with the same letter as their name. You can choose objects, but I personally like to do it with adjectives that describe the students. So student 1 would say, "I'm Allyson and I'm artistic. Then the subsequent students would say everyone before them and then themselves. Ex. Student 2: She's artistic Allyson. I'm Nicki and I'm nice. Student 3: She's artistic Allyson, she's nice Nicki. I'm Tiffany and I'm terrific! and so on. I can almost guarantee that some of these nicknames will stick in addition to the names! How to play: give students two different scenarios to choose from. They can either raise their hand to indicate their choice, or move to a particular side of the room. Ex. Would you rather be rich and ugly or good looking and poor? Have students move to the left of the room if they would rather be rich and ugly or they can move to the right of the room if they would rather be good looking and poor. You can find thousands of questions by searching "Would You Rather Questions" on Google or you can buy card sets like these. I also have this set of FREE ¿Qué preferirías? questions completely in Spanish! They come with task cards and questions that you can project on the board. Similar to the Would You Rather? Questions, you can designate one side of the room for Me Gusta and another side for No Me Gusta. Then call out or show words in Spanish for foods, animals, etc. For beginner students, you can use cognates to be able to stay in the target language. For each item, have students go to the side of the room based on whether they like the item or not. How to play: have students write down 3 things about themselves with two being truths and another a lie. The truths would ideally be things that are hard to believe and the lie would ideally be something that would be easy to believe. Have them read the 3 "facts" and have the other students guess which is the lie. You will find out some very interesting things about your students! Learn all about your students with this about me infographic activity. You can download it for FREE here. Have students complete these in Spanish or in English for beginner students. You can display these around the classroom for students to learn about each other. You can tell a lot about your students based on how they spent their summer! 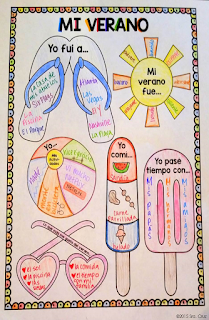 With this My Summer Activity, students tell where they went, what they did, what they ate, who they spent time with, give adjectives to describe their summer, and tell what the most like about summer. You can use the Spanish version for upper levels and the English version for beginners. Bonus: It also comes with an End of the Year version where students can talk about their upcoming summer plans using a different verb tense. You could do both and have students compare the 2 to see how their plans and Spanish knowledge have changed through the school year. I found this awesome idea on Pinterest! How to play: Take a ball and write "Get to Know You" Questions on it. Toss the ball to a student and have them read the question that is closest to their left thumb, right index finger, etc. Then they would share their answer to that question and toss the ball to another classmate. The source of this activity also listed the 52 questions she used on her blog. 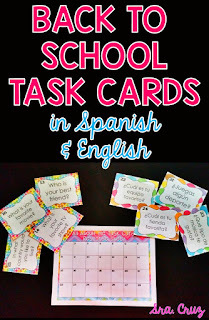 These Back to School Task Cards have 28 questions in both English (for beginning Spanish I or other subjects) and Spanish (for upper levels) as well as an editable template to add your own questions. How to play: Print out task cards, cut them out and place a card on each desk. Using the response sheet, students record the answer to the question on their desk. Then students can either pass the card in a designated direction or play Scoot where they move to the next desk and answer the question on that desk. You could also post the task cards around your classroom to get students moving even more! 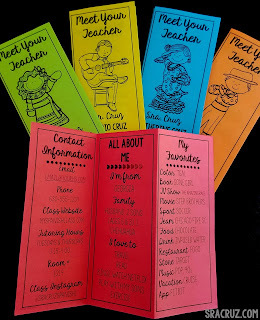 When they are done, you'll have a response sheet filled with all kinds of information about your students! You can post these for students to read and include your own. I also suggest reading through these and making some mental notes about your students' answers, especially things that they have in common with you. A simple "Did you hear Ariana Grande's new song?!" "Can you believe who got evicted from Big Brother last night?" or "That's my favorite book too!" will go a long way in making connections with students. Don't forget to help students learn about you! 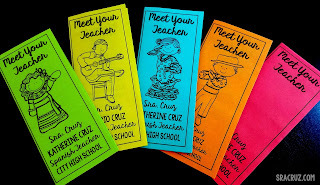 In addition to creating a teacher version of some of the ideas above, you can also use these Meet Your Teacher Brochures! These are great to pass out to students and parents on Meet the Teacher Night, Curriculum Night, or the first day of school. They can learn about your background and life outside of the classroom. Plus, it never hurts for parents to know your favorite stores and foods when they are thinking about teacher appreciation gifts! ;) Theses are completely editable and are available in English and Spanish or a bundle of both. I hope you were able to get some great relationship-building ideas! If you have others, please post them in the comments! 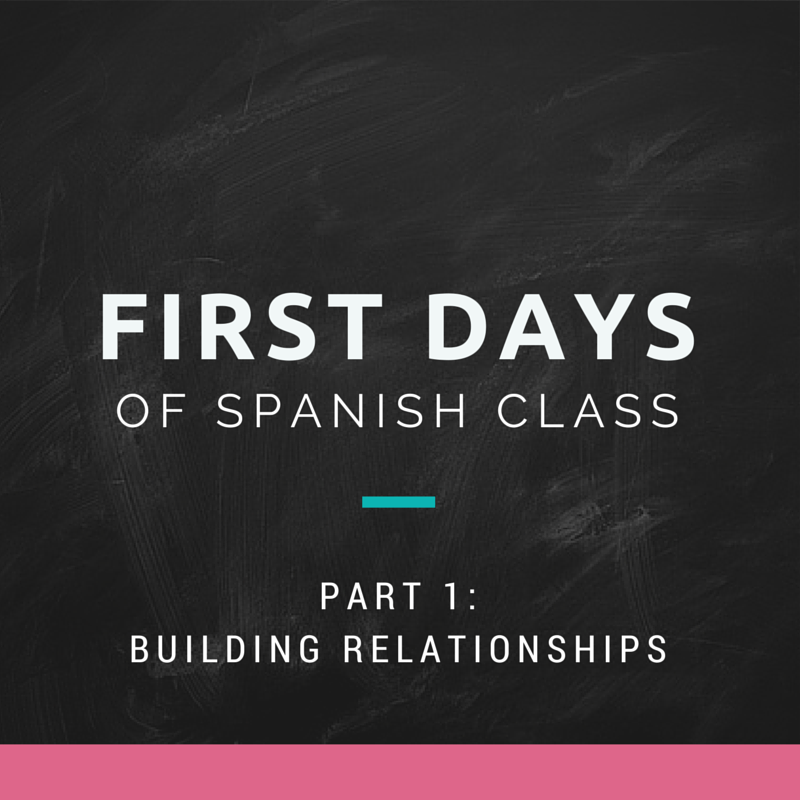 Now head on over to First Days of Spanish Part 2: Rules and Procedures! My students enjoyed this so much! I am so grateful. Thank you! I'm so glad to hear that, Kimberly! Thank you so much for stopping back by to let me know! I hope you have an awesome school year! How long (out of the first week) do you spend on these activities? I will be teaching my first year at a middle school and I believe their classes are 45 minute. Thanks in advance!!! Hi, Adriana! I would usually spend the first week or so doing the get to know you activities, rules & procedures, and TPR activities that are in the 3-part series of posts. I hope this helps! Still a great resource!! I dont know why but I am finding myself with not a lot of energy or inspiration to start this new year... :( it will be my frst time doing 8th grade after doing elementary and im scared silly. I hope they like these!! Visit Señora's profile on Pinterest. Designed by Teaching In A Nutshell. Powered by Blogger.